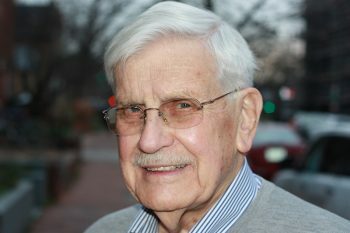 Roy Matthews ’54 Used His IRA to Help History Professors at W&L Roy Matthews's career in academia helped him understand the challenges faced by professors in the humanities--and how he could help. Roy Matthews’s shaky start at W&L did not hint at his future career as a successful university professor. During a recent telephone conversation from his home in Washington, D.C. he described his journey from struggling during his first term at W&L to being a history scholar and author. He also talked about his decision to support the W&L History Department, where his journey began, through his IRA. The studying worked. After graduating from W&L in 1954 with a degree in history, Roy earned an M.A. from Duke and a Ph.D. from UNC Chapel Hill. He ultimately spent 31 years at Michigan State University, teaching in the Department of Humanities and later the Department of History. During his years in Michigan, Roy kept the W&L fires burning. He worked as an alumni admissions volunteer, interviewing potential W&L students and making presentations at local high schools during college nights to tell them about a little school in Lexington, Virginia. One of the fruits of Roy’s continually evolving relationship with W&L is the Roy T. Matthews ’54 Endowment for History. He established it in 2013 to support students and faculty in the History Department. During his years at MSU, he observed that while the sciences benefited from large grants, budgets in liberal arts departments were always modest. More than once during his career, in order to go to an academic conference, Roy had to plead with a department chair for help to pay for a plane ticket, a hotel room, or some part of the cost. Travel and research, Roy knew, were an area where a relatively small gift could make a big impact. For that reason, he decided to establish a fund to support the new generation of teacher-scholars who are following in the footsteps of Adams, Desha, Dickey, Fishwick, Jenks, Johnson, Leyburn, Pusey, Reigel, Starling, Stephenson, Turner, Welch and many others who prepared him and his classmates for an unknown future. When he has the time, Roy drives from Washington to Richmond, Virginia, to join seven or eight members of the Class of 1954 who get together for a monthly luncheon at the Westminster Canterbury retirement center. The continued importance of W&L in the lives of these octogenarians is striking, but Roy explains it so easily that it’s clear he has thought of it often since 1954. “Those four years are the most formative years of any person’s life, even more so than high school. You are thrown into an academic environment where you are challenged. You work hard, and you can see the results of your efforts. You have professors there who encourage you, and they keep raising the bar every time they encourage you. They are pushing you and you don’t even know that – you don’t always understand that at that stage in your life. To fund his endowment, Roy Matthews ’54 designated W&L as the beneficiary of his IRA upon his death. A couple years after setting up the paperwork, he felt compelled to try to fund the endowment during his lifetime. He didn’t like leaving to his wife and family the logistical work of finalizing the funding after his death. And, he wanted the endowment to benefit the History Department sooner rather than later. But, there was a matter of taxes. “I wanted to go ahead and fund it, but I would have to pay taxes on it,” Roy said. “When I learned I could roll over my IRA funds for a charitable distribution that removed the major road block.” In 2016, Roy took advantage of the IRA charitable rollover provision that Congress had just permanently authorized the year before, and he was able to fund the entire endowment handily. This academic year the Roy T. Matthews ’54 Endowment for History began contributing funding to the History Department at W&L. To follow in Roy’s footsteps and designate W&L as a beneficiary of your IRA in your estate plans, or to take advantage of the IRA Charitable Rollover and see the results of your giving now, contact W&L’s office of gift planning at 540-458-8902.